(another, earlier, cave church to be added later, and captions also). as little light can get into that area from the tiny window that is off of it. No flash was allowed, so these are long exposures without tripod, at iso400. 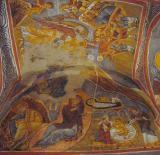 The still-vivid frescos are scenes from the New Testament and include Christ Pantocrator (from El Shaddai, or Jesus of Nazareth), Adoration of the Magi, First Bath, Last Supper, Betrayal of Judas, the Crucifixion, and the Resurrection. Per Wikipedia, this monastic compound was built in the 11th century, and for too long, it was used as a pigeon house until the 1950s. 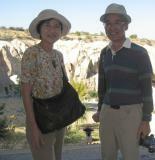 It took 14 years to scrape the pigeon droppings off the walls, and these are the best preserved in all of Cappadocia. Fabulous photos of the Dark Church. Just got back from Turkey two weeks ago. The photos are almost better than the real thing because I have time to study them. Thanks!!! Glad you enjoyed them, and thanks for letting me know.